The education of a young Nazi, from fetus to 9-year-old. One of the lesser-known Nazi atrocities, the Lebensborn program, aimed to increase the numbers of so-called Aryans; the program encouraged sexual contact between SS officers and unmarried (sufficiently blonde) white women while also Germanizing 200,000 kidnapped European children. 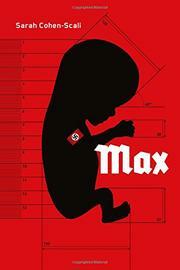 Max is a fictional Lebensborn child, born in 1936 of unmarried parents. He begins his narrative in utero, determined to be born on April 20, the Führer’s birthday. Platinum blond and with icy blue eyes and a perfectly Aryan dolicephalic head, he plans to become an ideal Nazi, full of Draufgängertum—a hotheaded lack of self-preservation. As a fetus and an infant, Max’s point of view is that of an adult true believer, full of grotesque crudeness, endless sexual violence, and unremitting anti-Semitism. He’s eager to serve the Reich, even as a toddler, and he gladly helps his eugenicist keepers identify appropriately Nordic-looking children to kidnap. Though he’s intellectually convinced of Hitler’s philosophies, Max’s visceral discomfort with Nazi atrocities expresses itself through stomach troubles (described in scatological detail). A dysfunctional friendship with a blond, blue-eyed teenage Polish boy with a terrible secret only accelerates Max’s poor digestion. After a slow start, readers will find Max’s story reminiscent of M.T. Anderson’s National Book Award–winning The Pox Party (2006).